People > Stories > Extra…Extra…Read All About It! 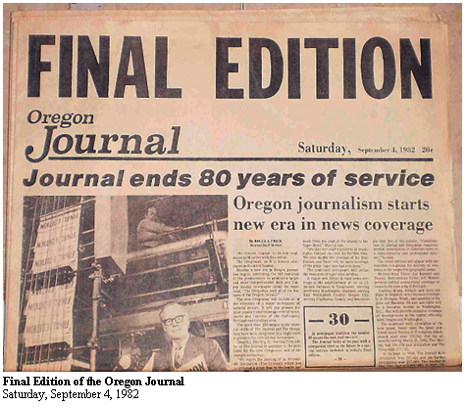 In 1941, when I was eleven and we lived at 101 N. Fremont Street, between Williams and Vancouver Avenues, I was fortunate to have a newspaper route; wherein, I delivered the evening edition of the Oregon Journal to homes in my neighborhood. Today, that paper is no longer in circulation. It was sold to The Oregonian in 1961, due to a prolonged strike that threatened to bankrupt the owners. Then, over time, a substantial decrease in circulation caused the Journal to be shut down. Its final edition was published on September 4, 1982. The sequence of events to delivering the papers began every afternoon, when the Journal's newspaper truck dropped off that evening's edition, at their route manager's office on the Southeast corner of Williams Avenue and Beech Street; one block from where I lived. There, the route manager would stack, in separate piles, the number of papers to be delivered to the homes in each route under his supervision. Although I do not remember how many papers I carried on my route, quite often, there would be one extra to be given away or sold: An incentive to bring in a new customer, for which we would receive a cash bonus. 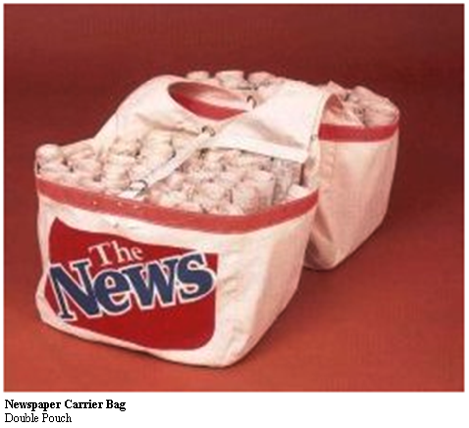 The evening papers were carried in a double pouch carrier bag, which had a hole in the top to slip my head through; thus, allowing the straps of the bag to rest on both shoulders; with half of the papers in each pouch, front and back. While walking my route, which must have covered a three or four block radius, I would fold the papers into a very tight roll so they could be thrown, with accuracy, from the sidewalk onto each customer's steps or porch, without coming apart. Accuracy was important, especially on rainy days: Customers were not happy with wet papers. If it were a rainy day, I would fold the papers at the office; and then cover each pouch with its attached flap, to keep the papers dry as I walked my route. 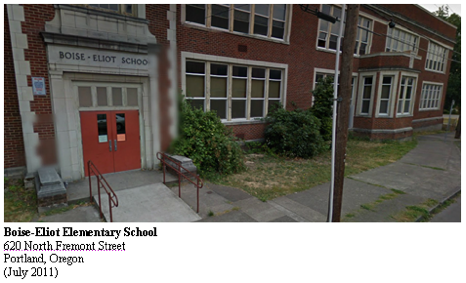 Since the Journal was delivered in the late afternoon, the timing of that paper route worked out very well for me, because I was a student at Boise - Eliot Elementary School, 620 North Fremont Street, just four blocks from home. When school was over for the day, there was still plenty of time to play around, before I had to deliver my papers. That paper route was also very good to me, in that I somehow managed to acquire a prime location for displaying and selling, on each Saturday afternoon and evening, the Journal's Sunday Edition. 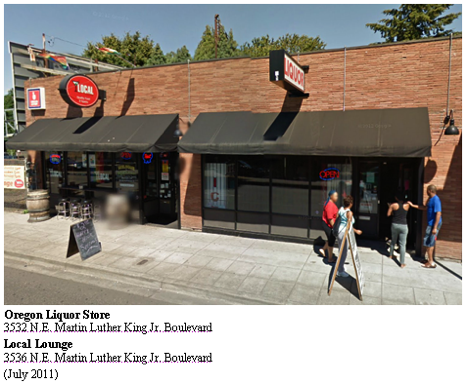 Only five blocks from home, that prime location was the Oregon Liquor Store, at 3532 N.E. Union Avenue, with its spacious 45-degree recessed entrance. Not only was that a prime location because of the Liquor Store's heavy, Saturday evening foot traffic; it was also a prime location because it was in the same building as Bihn's Lincoln Park Grocery and Market, next door, at 3536 N.E. Union Avenue. Their foot traffic was also good, because that was where many Volga Germans purchased Bihn's famous links of smoked German sausage: A Saturday dinner ritual. Today, both entrances are smaller and in a different location, which suggests that the building has since been remodeled. The Oregon Liquor Store has kept the same address, while Bihn's, which closed its doors in the 1970s, is now the Local Lounge with the original address. However, since 1989, the street is now named Martin Luther King Jr. Boulevard, instead of Union Avenue. Though that paper route brings back many fond memories, what is most vivid in my mind; is Sunday, December 7, 1941. 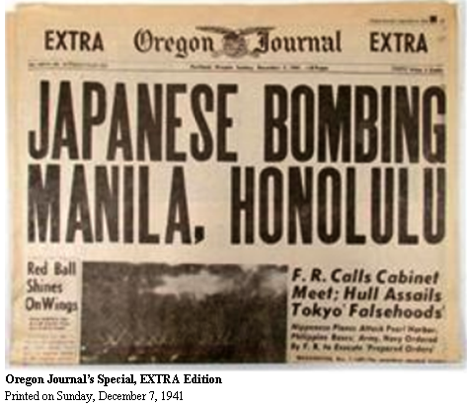 On that day, the Oregon Journal printed a special, EXTRA edition; and I shouted, Extra…Extra…Read all about it…Jap's attack Pearl Harbor! 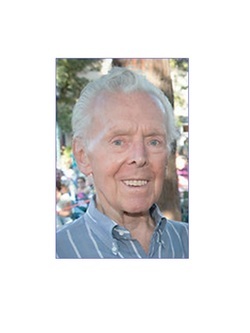 I shouted those words, repeatedly, as I stood on the southwest corner of Fremont Street and Williams Avenue. I chose that spot because that was where a stop sign was located. Which meant that any car traveling east on Fremont had to stop at Williams. At every car that did stop, I shouted Extra…Extra…Read all about it…Jap's attack Pearl Harbor! Then, while approaching the stopped car, I would extend the front page, so they could read the headlines. If they were not already aware of that dastardly attack, the shock on their face told me they were going to buy the paper. Although the paper sold for three cents a copy, many a customer gave me a nickel, and told me to keep the change. I have no idea the number of papers I sold that day; however many it may have been, I could have sold more. Countless experiences, in our youth, carry us through life. Contributed by Melvin W. Cook, December 8, 2012.